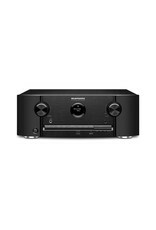 Packed with the latest audio and video technologies, the Marantz SR5013 lifts your Home Theatre to a new level, with Dolby Atmos and DTS:X bringing you breathtaking 3D surround sound with today's advanced movie soundtracks, and is fully equipped to deliver the renowned Marantz Hi-Fi and Home Theatre sound. The amplifier section is rated at 180 watts on each of its seven channels, giving it the power to fill even large spaces, while advanced Audyssey MultEQ XT tailors its sound perfectly to your room. For vinyl lovers the SR5013 comes equipped with a direct phono input. The video section features 8 HDMI inputs (including 1 on the front panel), with full compatibility with the latest 4K Ultra HD video specification, including 60 Hz full rate content, 4:4:4 Pure Color sub-sampling, BT.2020, HDR, HLG (Hybrid Log Gamma) and Dolby Vision compatibility. It's also HDCP 2.2 compliant, for 4K Ultra HD copy-protected content. Built-in HEOS wireless multi-room music network technology means the SR5013 can become the hub of a HEOS system, letting you enjoy your favourite music around your home. Explore, browse, and play music from your own network library, from online streaming services, and from thousands of internet radio stations - all controlled using the free HEOS app or by voice in combination with an Amazon Echo device. 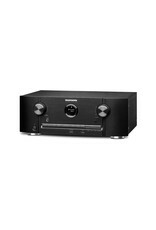 The SR5013 also features Bluetooth and AirPlay 2 compatibility to stream music directly from any compatible device. The SR5013's power amp section features discrete high-current output devices for superb sound with both music and movies, with identical power on all 7 channels for precision sound. Rated at 180 watts per channel, the SR5013 features low-impedance drive capability, for excellent speaker control, and is compatible with 4 ohm speakers too. Meanwhile the Eco mode provides energy savings: it features an on-screen Eco meter, while it’s also possible to use the receiver in power-saving mode, either reducing the maximum output power or adopting low-power strategies at more modest settings – and all without any effect on the superb sound quality. With 8 HDMI inputs, including one conveniently located on the front panel for quick connection of video sources, and dual HDMI outputs, the SR5013 has an advanced video section supporting the latest HDMI specification, including 4K Ultra HD 60Hz video, 4:4:4 Pure Color sub-sampling, BT.2020 and HDR pass-through support on every input. Dolby Vision compatibility and HLG (Hybrid Log Gamma) is newly supported, too. It also features HDCP 2.2 compatibility, for 4K Ultra HD copy-protected content, on all HDMI inputs making it ready for the next generation of Blu-ray disc players, set-top boxes and 4K Ultra HD streams and downloads. The video processor can also upscale SD and HD video to 4K Ultra HD. Certified by the Imaging Science Foundation, the SR5013 features a full suite of video calibration controls (for use by an ISF technician), along with ISF Day/Night video modes. Feel every dimension in Dolby Atmos. Dolby Atmos transports you into the story with moving audio that flows all around you with breath-taking realism. Enjoy a 5.1 surround sound speaker system and 2 additional overhead speakers, or 2 Dolby Atmos elevation speakers for the ultimate home theatre experience - including Dolby Surround upmixer for legacy content. DTS:X™ immersive audio places sound where it would occur naturally in space, creating a lifelike, multi-dimensional audio experience in the home. The improved immersion and heightened realism draw you into the world of your favourite movies. In case you cannot install dedicated height or surround speakers, DTS Virtual:X adds the complete immersive experience regardless the number of speakers or configuration, even without overhead speakers installed. Featuring Bluetooth & Wi-Fi streaming connectivity, the SR5013 is equipped with an advanced dual antenna transceiver system, for robust streaming even in congested urban environments. With Apple's AirPlay 2 compatibility, you can enjoy listing to your favourite tracks wirelessly from your favourite iOS device such as iPhone and iPad. With built-in HEOS wireless multi-room technology, the SR5013 can become a key component of a HEOS system. You can enjoy your favourite music anywhere and everywhere around your home, controlled by the free HEOS app. Command music in every room from any device to play the same song in every room, or different songs in each zone. The HEOS app opens the gate to multiple steaming services on your SR5013 or any other connected HEOS devices, including Spotify, TuneIn Internet radio, Amazon Music , Sound Cloud, Tidal, Napster or Deezer and more (*). You can also stream music from your phone, USB stick, or local network drives, all using the HEOS app, with favourites and playlist functions supported. Enjoy hands-free control with Amazon Alexa and your voice. Adjust the volume, skip to the next track, switch inputs for your different media players and more — “Just Ask.” Download the HEOS Home Entertainment Skill to enable Amazon Alexa voice commands for SR5013, HEOS devices and other selected Marantz products. An Amazon Echo device is required. 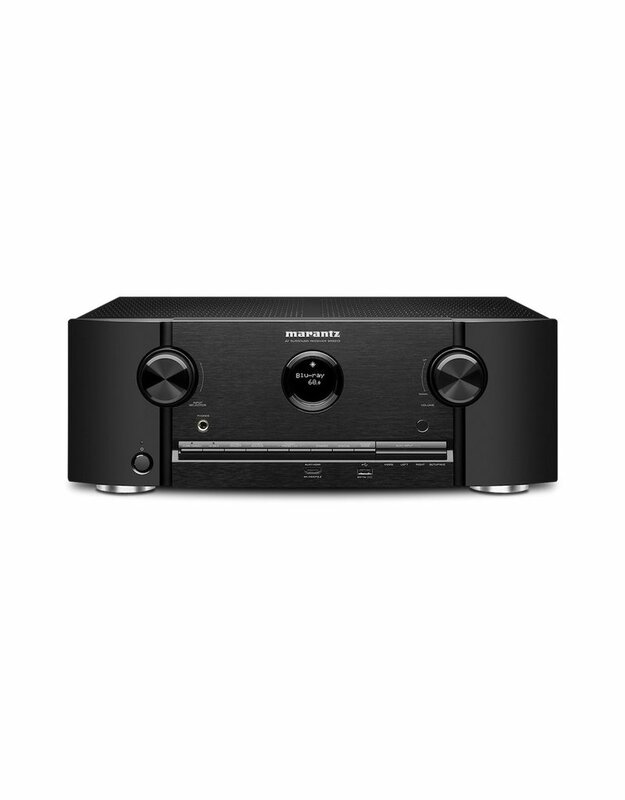 Re-designed from the ground up, the Marantz AVR Remote app gives you unprecedented control over the latest generation of Marantz network AV Receivers, from iOS and Android phones and tablets. Along with many new features, the graphics and user interface have been completely overhauled: control power, volume, input and settings, or switch within the app to the HEOS app to access an incredible range of music content and streaming services, all with full HEOS wireless multi-room control. Discover the incredible fidelity of high resolution audio with the SR5013's ability to decode up to 24-bit/192-kHz ALAC, FLAC and WAV lossless files as well as DSD 2.8MHz and 5.6MHz tracks (the audiophile format of SACD). Play hi-res music via the front panel USB port and network sources, and also listen to other popular file types such as MP3. 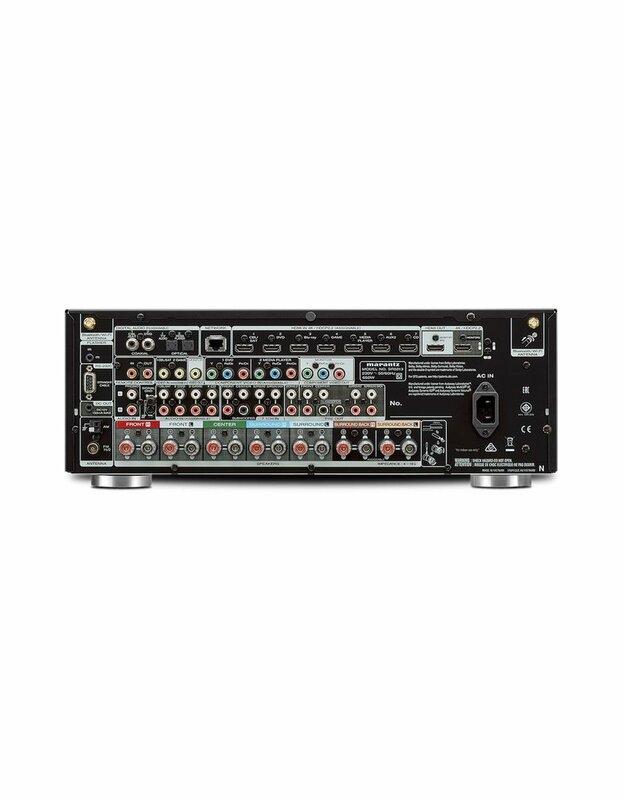 For optimum fidelity and the widest dynamic range with lowest distortion, the SR5013 features advanced reference-class 32-bit AKM D/A converters on all channels. This ensures consistent high fidelity and precise channel matching across all channels for the ultimate listening experience. Featuring exclusive Marantz HDAM (Hyper Dynamic Amplifier Module) technology found on our Reference Series components, the SR5013 incorporates multiple HDAM modules which provide superior low noise wideband performance in an all-discrete configuration, compared to conventional op amp ICs. HDAM technology provides an ultra fast slew rate for true wideband response and maximum dynamic range to deliver optimum sound quality with today’s high resolution audio formats. In addition to HDAM technology, the SR5013 also features Current Feedback instead of the typical voltage feedback configuration. A Marantz innovation introduced on our very first audiophile amplifiers more than 60 years ago, Current Feedback technology provides a wide closed-loop bandwidth and very high slew rate, delivering superior fidelity with wideband audio sources. Easily connect your analogue turntable to the receiver and enjoy the pure intent of each recording within your vinyl collection. Audyssey MultEQ XT automatic room acoustic measurement and correction system matches your speakers to your room's acoustics, for the smoothest, most natural tonal balance. MultEQ XT provides greater filter precision for the main and satellite speakers, with 8 times the resolution of the base MultEQ system, at up to 8 measurement locations. Audyssey Dynamic EQ uses advanced psychoacoustic algorithms to continually adjust tonal balance so that the sound you hear is full range, even at lower volume levels, and Audyssey Dynamic Volume smoothes out annoying volume jumps, especially with loud commercials. The SR5013 supports the brand-new Audyssey MultEQ Editor App. Go ‘under the hood’, view and adjust settings for detailed tuning, customize the sound more precisely to the specific problems in your room, and tailor the sound to your personal preferences. View the speaker detection results, to check correct installation. View before and after results of the Audyssey calibration, making it easy to identify room problems. Edit the Audyssey target curve for each channel pair to suit your tastes. Adjust the EQ frequency adjustment range for each channel pair. Switch between 2 high frequency rolloff target curves. Enable/Disable midrange compensation to make the vocal region brighter or smoother. Save and load calibration results. The Audyssey MultEQ Editor app, for Android and iOS, is available for purchase from the Apple AppStore or Google Play Store. The SR5013 has a range of features to provide enhanced control and compatibility with 3rd party and custom integration solutions. For compatibility with other components there's a remote control input and output on the rear panel, along with a flasher input and a 12V trigger output, while for direct connection to external home automation and control equipment, there's an RS-232C serial port. The SRM - Smart Remote Management access allows CI dealer utilizing ihiji or Domotz 3rd party management system to setup the unit from remote location. A single subwoofer demands optimal placement to avoid audible peaks and dips in the low-frequency response at the main listening position. The SR5013 supports two subwoofers: used in different locations, these will even out the low-frequency response for more accurate bass anywhere in the room. Whatever your family's entertainment needs, the SR5013 delivers: you can enjoy 5.1-channel surround sound in the main room, and at the same time play stereo sound from another source in a different part of the house. Simply connect a pair of stereo speakers to the multi-room amplified outputs, or hook up a separate stereo amp and speakers to the Zone 2 pre-outs, and you can still enjoy full 7-channel surround sound in the main room. Via the HDMI CEC (consumer electronics control) functionality on some Smart TVs, it's possible to control the SR5013 with the TV's remote handset. With the receiver's "HDMI control" set to ON, set "Smart Menu" receiver control functions and the TV's Smart Menu home screen will provide you direct access to source and surround mode selections, the main setup menu, and Smart Select configuration presets. The SR5013 has four Smart Select buttons on the front panel and the remote control: each stores a preferred setup – input, volume and Audyssey configuration – for a particular source. Push one button and the SR5013 can be perfectly configured for anything from Blu-ray or your TV set-top box to your favourite Internet radio station. For easy installation, the SR5013's horizontal row of premium loudspeaker terminals is colour coded, with a set of matching cable-labels supplied to ensure correct hook-up. The AVR's clear graphical on-screen display has an exclusive Setup Assistant, combining with the Quick Start guide to provide guidance and optimise critical settings for the best possible sound quality, whatever your configuration. Founded in 1953, Marantz has a long and rich history of designing audio components embraced by music lovers and critical listeners around the world. Because Music Matters so much in our lives, the SR5013 carries on our long tradition of delivering superlative stereo listening, as well as the ultimate home theatre experience.